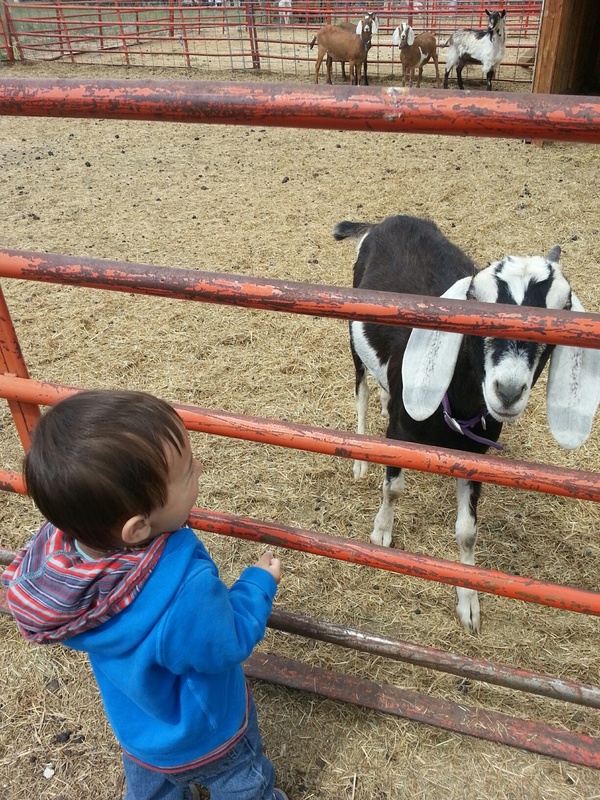 Goats and Coyots… and Soap! Local Soapmaker and Farm Tour! 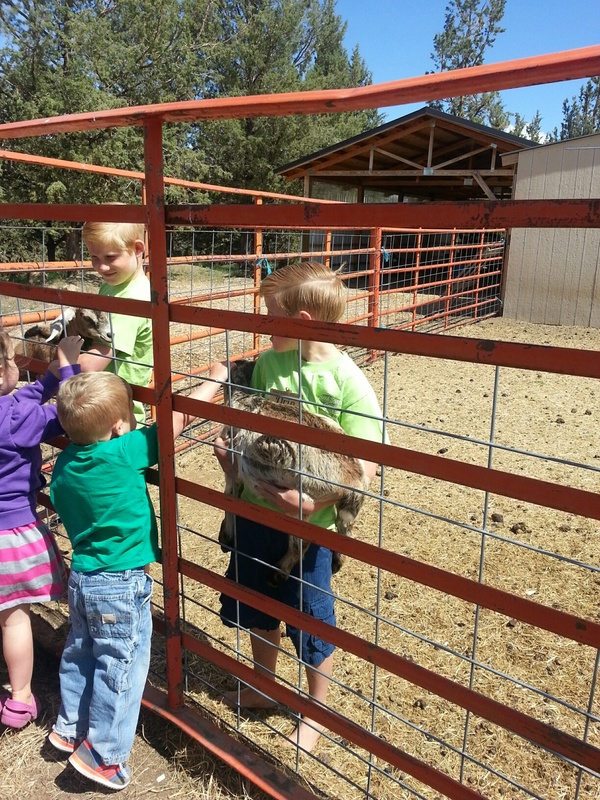 Recently, I set up a Kids and Mama tour at Bend Soap Company‘s farm and workshop in Tumalo. Just minutes away from Bend, Ore. though, certainly, out of town and decidedly more ‘farm country’! 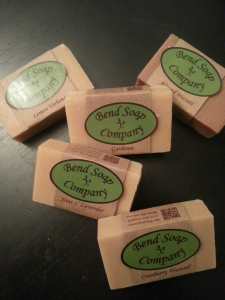 I came across Bend Soap Company at WinterFest in early-2014. As we chatted with the friendly owners, we learned that they offered tours of their farm and soapmaking workshop! YAY! I just knew this would be a perfect event for my local mama’s group, Moms Meetup of Central Oregon and it did, indeed, turn out to be fun! 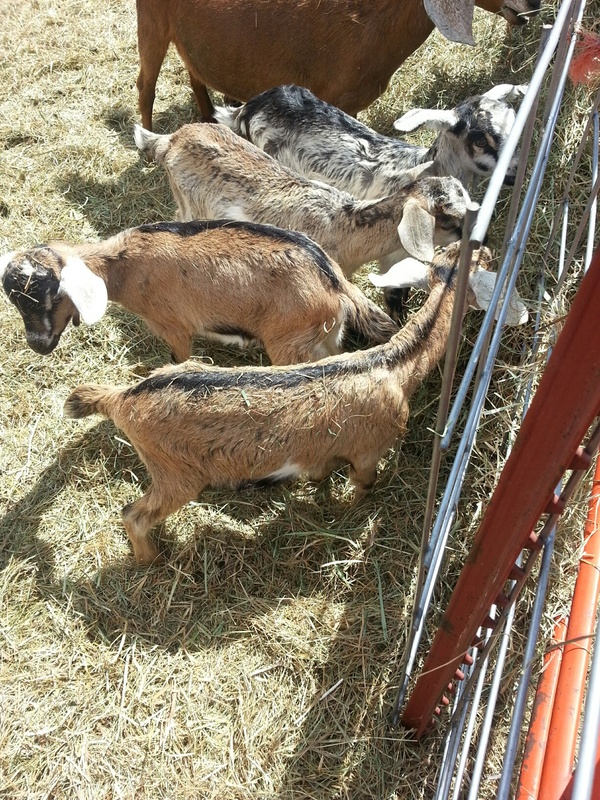 At the end of May, 9 mamas, 1 grandma, and about 11 kiddos embarked on the goat farm of Bend Soap Company. Perfect timing to see a few goat kids! We were welcomed by a super friendly staff and excited sons of the owners. The Johnson family boasts 6 boys and 1 baby girl! We were then taken out to see the goats… the Johnson boys were, seriously, so adorable in the way they ran about picking up baby goats and bringing them over to the fence so that our kiddos could interact and pet these cute little babies! 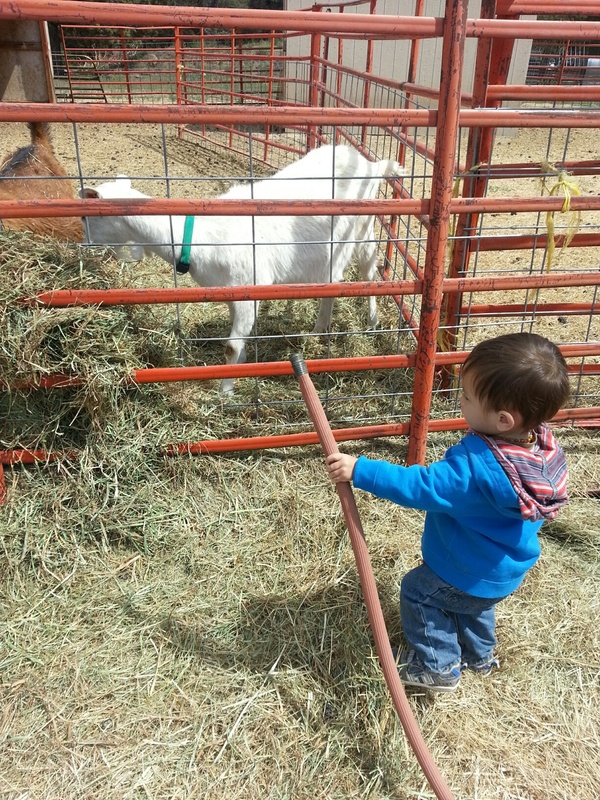 My own toddler son was more interested in playing with water hoses than the goats… but, eventually, he noticed the goats and wouldn’t stop talking to them! 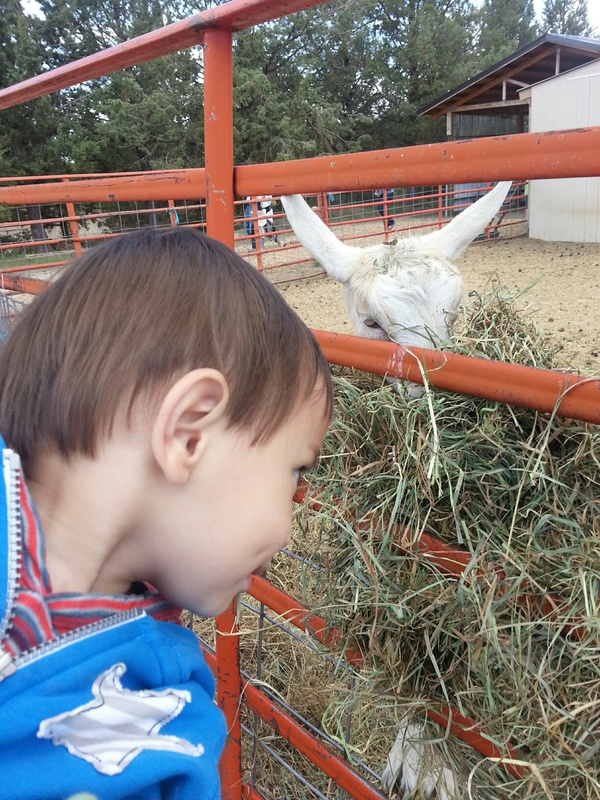 Then he started pretending to eat the hay with them! The tour was great… but let’s not forget about the products! The soap was born out of the need to help one of the boy’s with this eczema… it worked wonders, so they started selling it! Bend Soap Company’s soap is silky smooth and they have some great ‘flavors’… Lavender, Almond Biscotti, Gardenia, Licorice, Island Coconut (new! ), and more! They have, also, added lotion to their product line… this too is silky, thick, and nourishing! With all the great ‘flavors’ as the soap… by far, Island Coconut being my favorite at the moment. There are lots of other products to consider, including bulk soap scrap and tee shirts. Oh, yeah, and what’s the deal with the Coyote, as named in the title of this post!? Well… on our way home… as we passed Bend Distillery (with its great view of the mountains)… a beautiful coyote crossed the road in front of us! It was, actually, really cool to see his Wylie self as he cautiously crossed the road and checked everything out. He was not straggly, but rather fairly healthy looking (translation : he’s been eating!). I took this coyote sighting as a reminder that the life of a farmer is filled with rewards and hardship and that farmers are such an important part of the landscape of all of our daily lives! It was a great event and one that I plan to repeat soon! If you are in the Bend area and have kiddos, get in touch with Bend Soap Company, they might have space or time for a tour Mon-Fri from about 10am-4pm. Enjoy your Summer and Enjoy Central Oregon!